Sometimes it is hard to mellow out on our own. Meditation has always been a challenge for me. My mind races most minutes of most days. Things I need to do, things I forgot, things I want to ignore that annoyingly present themselves, usually in the middle of the night. If any of this sounds familiar, you may benefit from a little help taking a step towards stillness (which seems unattainable for most of us). I was making small talk with a few women at an event and one woman mentioned that she is super calm these days. I startled her and everyone around us when I all but leapt towards her and semi-demanded, “how! ?” I think I was supposed to follow the “how are you” decorum here in the states, which is lie and say “fine” or just nod politely in this case. Anyhow, to my delight she did not mention going to an ashram or working 15-hour weeks. She credits an app called Buddhify. I went home and downloaded it immediately. 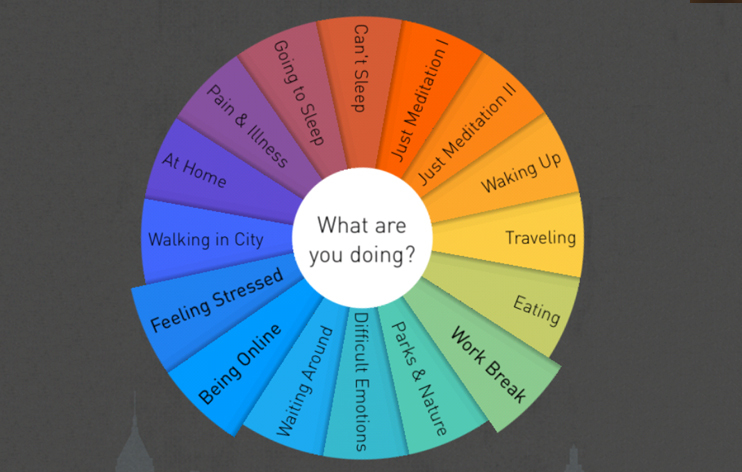 Buddhify has an absolutely awesome graphic wheel that is super easy to navigate. Options like: Waiting Around, Can’t Sleep, and Feeling Stressed pinpoint real day-to-day experiences. I tend to use the “Going to Sleep” option. I am notorious for tossing and turning and indulging in a little too much technology before bedtime. The first time I used it I woke the next morning and wondered if I had been drugged? I fell into such a quick and deep sleep with no recollection of the end of the meditation. Check it out, if it worked for me it can literally work for anyone!